Ultra Tech Enterprises | Railroad Testing Equipment | B1 Relay Test System Welcome to Ultra-Tech Enterprises, a Railroad Testing Equipment Provider in Punta Gorda, Florida . and to recharge the sealed lead-acid battery. The battery charger/power adapter and the input cable may be stored in the external storage pouch for transport. The B1 Relay Tester is a basic microprocessor-based relay tester with a primary objective to test for sticking relays through visual observation of contact operation. In addition, the relay tester measures pick up and drop away values. A standard B1 relay plug board provides mounting and electrical connectivity to the relay under test. 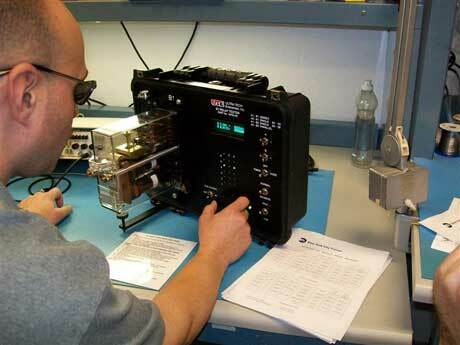 The B1 Relay tester is installed in a heavy duty, water resistant, plastic Pelican case. A snap-on vinyl pouch on the outside cover provides storage for the battery charger/power adapter, accessories, and cables. the relay tests. The B1 relay plug board is mounted on the front panel. The front panel controls and indications provide for control of the test and indication of the test parameters. opened, and the cover is removed. Two stabilizing bars are provided to hold the B1 Relay Tester in the desired orientation. These bars are stored in the accessory pouch for transit. The B1 Relay Tester provides three modes of operation. These are the Basic mode, Timer mode, and Code mode.